Oct 17, 2018 (LBO) – Sri Lanka’s President Maithripala Sirisena has instructed the Finance Ministry to study the current imports and submit a report on goods of which the imports can be temporarily restricted. President has made these remarks at the 20th session of the National Economic Council, which was held at the Presidential Secretariat yesterday morning. 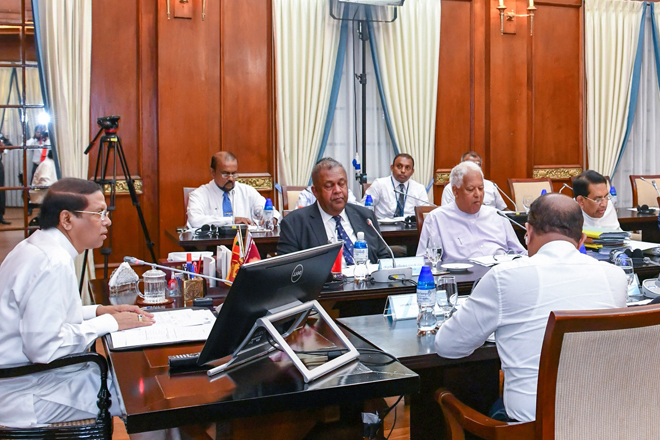 The National Economic Council has deliberated extensively on measures that Sri Lanka should take in the context of challenges arising due to the appreciation of the US Dollar. Special attention has been made to restricting the import of non-essential goods as a temporary measure while encouraging local substitutes. It has also been discussed to revise the measures currently in place to restrict the import of non-essential goods. The President has highlighted the importance of restricting the import of non-essential polythene products that have significant environmental concerns and impact local industries negatively. He has pointed out that the country’s prevailing negative balance of trade can be neutralized by prudent measures to revise the import of non-essential items when combined with a proper mechanism to collect the due levies at the point of customs clearance. The National Economic Council has emphasized the need to screen all containers instead of the present system of random screening at Sri Lanka customs. The President has also asked for an urgent report on the status of the screening capacity of Sri Lanka customs. Ministers Mangala Samaraweera, Rajitha Senarathna, Dr. Sarath Amunugama, Duminda Dissanayake, Mahinda Amaraweera, Mahinda Samarasinghe and Malik Samarawickrema participated in the discussion. Secretary to the Finance Ministry Dr. R.H.S. Samaratunga, Senior Deputy Governor of the Central Bank Dr. Nandlal Weerasinghe and other officers were also present at the session.